Spud Gun I was born out of frustration. I had been meaning for some time to build a trebuchet, a sort of Medieval catapult. But the design and mathematical analysis were going slowly. In the meantime, the urge to hurl something was strong. 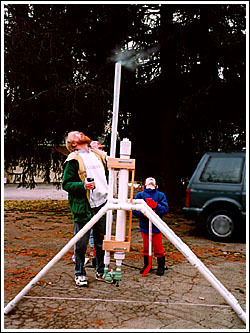 A friend told me about a potato gun his boss had built; this consisted of a length of PVC pipe with a spud jammed down its throat, first applying a liberal squirt of hairspray or some other flammable substance. When ignited, the potato would sail gracefully over the landscape, accompanied by a satisfying "Boom!" While compelling, a potentially explosive flamethrower in the backyard was not something I wanted my children playing with. However, a quick Web search revealed that there are a surprising (some would say appalling) number of people dedicated to launching vegetables into low Earth orbit. Many of these are variations on the combustion principle, but there are also pneumatic designs. These work with compressed air, and are generally much safer than the pyrotechnic variety. My version is a direct descendant of one designed by Bill Mills. This consists of two pieces of PVC pipe: one acts as a reservoir for the compressed air, and the other serves as the barrel. They are connected by an underground sprinkler control valve, which can be found at most hardware stores. See Bill's site for explicit instructions on connections, wiring, and so forth. In my case, the reservoir is a 40 inch piece of 3 inch diameter Schedule 40 PVC, rated at 260 PSI; the barrel is 72 inch long piece of 1 1/2 inch Schedule 40 PVC, rated at 330 PSI. The valve is a RainBird 1 inch control with an anti-siphon valve. This is the weak link in the construction, rated at 150 PSI. With this in mind, I have never attempted to pressurize the gun to more than 100 PSI, which makes for a pretty good workout with the bicycle pump we use - get one with a pressure gauge built into it. Other miscellaneous bits and pieces were found in the usual way - innumerable trips to the local hardware store. This is a muzzle-loader; the spud, shaped with a fortuitously sized biscuit cutter, is shoved down to the bottom of the barrel with a broomstick. The reservoir is pressurized and, once everyone is safely out of the way, the valve is opened. It is wise to look well ahead of the end of the barrel; the spud is moving too fast to see when it leaves. When pointed straight up, the potato has a hang time of 10 to 12 seconds. Ignoring air resistance and other sources of friction, we can use the formulas for free-fall acceleration to find the initial velocity and maximum height attained, given the hang time. The pertinent formula for height is y = 0.5 * g * t^2, where g is the acceleration due to gravity (32 feet / second^2), t is the time (5 to 6 seconds in our example; it takes as much time to go up as it does to come down) and y is the height, in feet. This implies that our spud reaches a maximum altitude of between 400 and 600 feet. Similarly, the formula for initial velocity is simply v = g * t, or between 160 and 200 feet per second, roughly 110 to 135 miles per hour. Don't stand in front of the gun, or point it at anything important. The legs of the stand are conveniently set at a 45 degree angle to the ground; fired at this angle, the potato achieves maximum range. Since we don't want to rain spuds on our unsuspecting neighbors or into traffic, we took the gun out to farm country to test its range. It was hard to keep the potato in sight; the equation for range, R = ( (v^2)/g ) * sin(2 * ang), suggests distances on the order of 800 to 1300 feet. The burst of "smoke" at the end of the barrel in the photo above is water vapor. Because the air expands almost instantly, it cools adiabatically below the dew point of the surrounding air, causing the water vapor to condense. Originally posted February 1, 1998.